Triumph Cat Formulas consist of premium, naturally delicious products, wholesome proteins, fats, and carbohydrates. Plus, they contain the premium flavor that cats love! 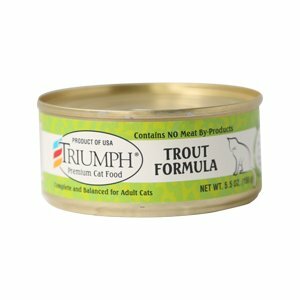 Moreover, when feeding your cat Triumph Trout Formula for Cats, it may be fed as a sole diet or mixed with dry food. This complete and balanced canned food is made for cats and contains added vitamins and minerals. The added vitamins and minerals help ensure that your cat is ingesting the essential nutrients needed to maintain a healthy, happy lifestyle. By choosing to feed your cat Triumph Trout Formula Cat Food, you are choosing a bright future for your pet!